Meru Cabs CEO Siddhartha Pahwa has resigned from the Mumbai-based radio taxi firm and will be replaced by CTO Nilesh Sangoi from January. The decision was first announced by Pramod Kabra, partner at India Value Fund Advisors (IVFA), Meru’s biggest investor, in an email to Meru’s top brass. Later on Tuesday morning, Pahwa addressed the company via an email to announce his departure. “I’ve decided to move over from Meru. I’ve spent a good five years in Meru. 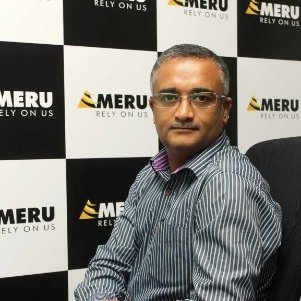 Meru is now a cash-positive, profitably growing organisation,” Pahwa told VCCircle. He said he hasn’t yet firmed up his plans. “Meru was a 24/7 job. Now I’m going to evaluate a few things, including the idea of an own venture or some opportunities that people have been discussing with me or take a break and then decide on my next move,” he said. Pahwa joined Meru in 2011. He was the president of supply chain and generics at Abbott Healthcare before joining Meru and has worked with Piramal Healthcare Limited and Unilever in the past. Under Pahwa, the company raised $25 million (Rs 150 crore) from Brand Capital, the ad-for-equity investment arm of media house Bennett, Coleman and Co Ltd, in June this year and mobilised Rs 300 crore ($50 million) from IVFA in March 2015. IVFA has infused $75 million into Meru Cabs since 2006. Pahwa led the company’s transition from an asset-heavy business model to an asset-light, mobile app-based business a few years ago. Meru Cabs mainly competes with heavily funded homegrown cab aggregator Ola and US-based Uber, the two new-age startups engaged in a fierce battle for market dominance. Pahwa said he expects the taxi industry to continue to grow at a high double-digit number and that there could be industry consolidation in six to 12 months’ time. “Once the capital dumping stops, which I guess will stop in the next 12-18 months, all the players will make a very handsome margin in this industry and therefore, the returns to the shareholders would be very attractive,” he said.